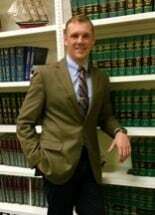 Brent A. Shelton is an associate attorney at Haymore & Holland, P.C. He was born and raised in Southside Virginia where he was instilled with the values of hardwork, responsibility, and determination from his time spent on his family's multigenerational tobacco farm. He has carried these values into his study and practice of law. He primarily practices in the areas of criminal defense, domestic relations, personal injury law, and related fields within the general practice of law. Brent is a of graduate Chatham High School, where he was a member of the 2009 State Championship Baseball team. After high school, he attended Methodist University, where he obtained his Bachelor of Science Degree in Political Science in 2014, and was also a four year letter recipient on the Varsity Baseball Team. He earned his Juris Doctorate from the Norman A. Wiggins School of Law at Campbell University in 2017. While in law school, Brent interned with Patrick K. Moore, P.C. as well as Haymore & Holland, P.C. and completed an externship program with the Honorable W. Osmund Smith III, of the Caswell County Superior Court. Upon graduating from law school and being admitted to the Virginia State Bar in 2017, Brent decided to return to his beloved hometown to provide legal assistance to citizens of Southside Virginia as an Associate with Haymore & Holland, P.C.